I thought I had posted this, but looks like I forgot 😦 Better late than never since the next episode will be aired in a couple of days. Honestly, I think that the teams in the first quaterfinal were better than the ones in this quaterfinal. This episode had Oxygen, Route 10 and Innovusions. These teams were equally poised and none of the teams dominated the rounds in this quaterfinal. Oxygen went on to go to the next round, while the other two got eliminated. But I especially liked the first song of Innovusions. They did not have much (any) vocal in it and it was a complete instrumental piece and was very well done. But Vasundra Das shot back saying that they should have used the vocal more prominently… come on.. let them be a little creative. Isn’t that the whole contest about. The other compositions were pretty good too, but I liked the one from Innovusions better. Looking forward to the 3rd quaterfinal and hoping that the teams outdo the ones in the first two quaterfinals. I forgot to mention in my previous post. The episodes of this new band hunt show is available at the official site www.oohlalala.in . If you are not in India and don’t have access to Sun TV, this is a very good (and official) source to watch these episodes. 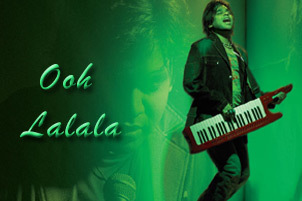 The first (real) episode of ooh…la…la…la was screened on Sun TV this Sunday. As I mentioned earlier, there are 18 bands in the quaterfinals and it is going to be three bands per quaterfinal and one of the bands will move on to the semis. Each quaterfinal consists of two rounds. One round where they have to compose their own song, write the lyrics and perform it. In the second round, the bands have to re-mix an existing song and perform it. The performance of the teams was just awesome. Ok. This is coming from an average person who knows just to enjoy the music and doesn’t know the nuances of it. But really, the music was really enjoyable and the bands had done a nice job of composing the music especially for the first round. Even the singers were quite versatile and performed really well. If you are not watching it yet, do watch it. This is the name of a talent hunt show that has been coming in Sun TV for the past couple of weeks. It is a show where a band (not an individual) has to showcase its musical talent. Sun TV has roped in big names like A. R. Rahman, Sivamani, Shankar Magadevan and Vasundhara Das for the show. The last two weeks has been like a teaser with the show being launched and information about the contest being shared etc. The contestants are really enthu about the whole contest and it is great. Shows like this helps them showcase their talents and also gives them the necessary exposure. There are other shows/contests that cater to individual talents, but this one is different as it caters to bands. It is good that the channel has come out with something like this. The show enters the quaterfinal stage with 18 bands and that number will come down as weeks pass by. My only concern: I hope Sun TV doesn’t get into the whole reality show thing. I just hope that this doesn’t turn in to one of those reality shows that concentrates more on the emotions and stuff between the partipants. I am keenly looking forward to a great and healthy competition as well as some great music.